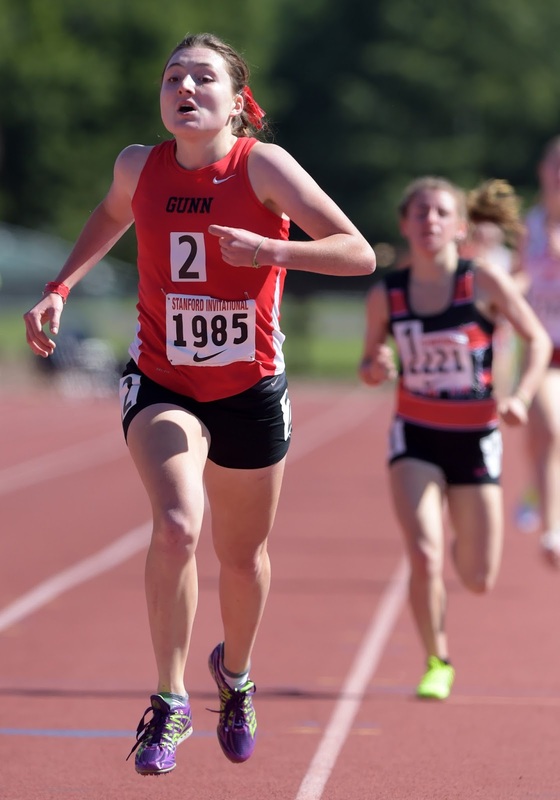 Today we chat with Gunn senior runner, Gillian Meeks. This past XC season, Meeks had her best season to date that included individual victories at the Stanford Invitational (Div 2 race), Clovis Invitational (Div 1) and SCVAL (El Camino) final. Her two best races of the season followed her league championship victory as she raced to an individual title at the CCS (Division 2) race with a personal record 17:17.6 at the Crystal Springs course. Two weeks later, Meeks faced some of the top runners in the state in the Division 2 final and you can read about her finish place below. This interview took place before her NXN race where she placed in 46th place. 1) What was the plan heading into the state meet as far as strategy and any time goals? Did you have any specific runners that you felt would be your biggest challenge? My plan heading into the state meet was to sit off the back of the lead pack through mile 1, and then just try to hang onto the leaders for the rest of the race and try to find one last gear to kick at the end of the race. I knew going into the race that Amanda Gehrich was the favorite and that most people would not have picked me to win with such a strong field of runners like Megan McCandless, Claire Graves, and Amanda Gehrich. However, after my solo 17:44 in 90 degree heat at the Clovis Invite I knew that I had the fitness to keep up with these girls and was definitely in contention to finish in the top 3. Going into the race, I had thought that in order to win I would probably have to run under 17:25 and wear out Amanda Gehrich’s kick so that it wouldn’t come down to a sprint at the end. I personally thought that winning was somewhat of a long-shot, so I went into the race just wanting to give myself the best shot of running a big PR and finishing as high as possible. 2) Tell us about the race itself and how it unfolded for you from the start, through 1 mile and 2 miles as well as the finish. I got out decently fast in order to get in contact with the leaders, but I wasn’t worried about trying to be right in the front of the race from the gun. Through the first mile I felt very relaxed and smooth and gradually worked my way up so that I was in around 4th/5th place, at the back of the lead pack behind Amanda Gehrich and Claire Graves. During the second mile I felt the pace start to slow somewhat, so I decided to take the lead of the front pack and push up the hill. That’s when Amanda, Megan McCandless, and I broke off from the rest of the pack. At the 2nd split all three of us were in a line across the course and pushing the pace. During the last mile Megan got a small lead on me and I, in turn, got a small lead on Amanda. Megan stayed about 20 meters ahead of me for most of the last mile until we rounded the corner onto the pavement for the final 400 meters. My coach, PattiSue Plumer, had pointed out this spot as a great place to make a move, so when I saw that Megan wasn’t extending her lead I started kicking with everything I had left. Once I passed her I could see the finish line and focused on that as I kicked as hard as I could. 3) When did it hit you that you are a California state cross country champion? What was your reaction? Who was there to celebrate with you? Until I was about 10 meters from the finish line, I was still worried someone was going to catch me. But once I crossed the finish line in first place, I felt a mixture of disbelief, elation, and exhaustion. I had given the race my 100% effort and it definitely took me a few minutes before I could actually comprehend what had just happened. Once I recovered a little and saw my family, friends, and coach beaming at me, it hit me that I had actually just become a California state cross country champion and had run a huge PR in the process. 4) Tell us about your coach Pattisue Plumer and how she has helped you get to this point in your running career. 5) From your first cross country experience as a freshman to now, who are the teammates and/or opposing runners who you feel have contributed to your success? 6) When do you feel like you made your biggest jump as a runner during your high school career and what do you feel led to your improvement? I feel like I made my biggest jump as a runner during my junior year cross country season. That season two of the best freshman in the state, Caroline Gee and Elena Kamas, entered my league, section, and division. They gave me great competition in every league race that season and pushed me to huge PR’s. That was the first cross country season I had where I was winning big meets and ranked highly in the state. That season my proudest accomplishments were winning the Stanford Invitational and the CCS Division 1 title. I felt that I gained a lot of strength and experience leading big races from my junior year cross country season. 7) What does a typical week look like for you in terms of training Monday through Sunday? Any morning runs? Strength training? Longest run? Typical mileage? Pace of most of your runs? Typical workouts?? Currently, my typical mileage during the season is 40-45 miles, but in the off season I now run 45-50 miles per week. The pace of most of my normal runs ranges from 7:20-8:00 pace. Typical workouts include any sort of tempos, 400 repeats with short recovery, and 1000’s at threshold pace. 8) Favorite XC Invitational? Favorite XC course? Favorite XC workout? Favorite long run? Favorite opponent? Favorite TF Invitational? Favorite TF event? Favorite TF workout? Favorite Gunn XC and/or TF tradition, Favorite free time activity? Favorite XC Invite: Stanford Invite, Favorite XC Course: Woodward Park, Favorite XC workout: Progression runs ending in 5k race pace, Favorite long run: there are so many great trails where we train, but some of my favorite places for long runs include Arastradero Preserve, Rancho San Antonio, and Black Mountain. 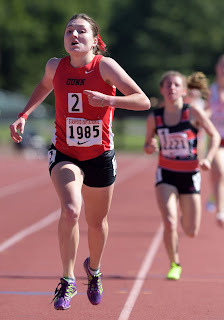 Favorite TF Invite: Stanford Invite, Favorite TF event: 3200, Favorite TF workout: 400’s at mile race pace with 1 min recovery, Favorite Gunn XC Tradition: So many! One strange tradition we have is to hit stop signs as hard as we can when we pass them on runs and see who can make the loudest noise. 9) You will be competing at NXN this Saturday. What led to your decision to run at that race as opposed to taking the Footlocker route? The biggest reason why I chose to run at NXN was because I had the opportunity to go straight to the National meet whereas with Footlocker I would have the stress and pressure of running another regional race. Qualifying for NXN was a goal of mine all season, and I am so excited to race there on Saturday!!!! 10) Now that you are a senior, what do you feel like you have learned the most from doing cross country that have helped you become a better runner and person? I think cross country has taught me so much about determination and discipline. You can’t be a successful runner without those two qualities, and I think having determination and discipline helps in every aspect of life, from school to future jobs. I also think cross country has taught me a lot about delayed gratification. There are many times in running when you put in all the hard work for a long time, but don’t see the results of your hard work until much later. 11) You will be attending Harvard next year. How many other schools were in the mix and what led to your decision to choosing Harvard? I took all five of my official visits and each school had very different atmospheres and programs. I was unsure of what environment would suit me best, so I wanted to make sure I had a good mix. In the end, it was a very hard decision between two schools but I felt that Harvard had the best combination of great academics and great athletics. I also liked that Harvard is an up and coming program and am very excited to be a part of the program’s growth. Humble, smart, talented. Nice interview. Congratulations on a superb high school cross-country career, Gillian! Best wishes for an outstanding track season and best of luck during your time at Harvard!